Map Showing the Work of The National Antarctic Expedition. 1902 - 3 - 4. 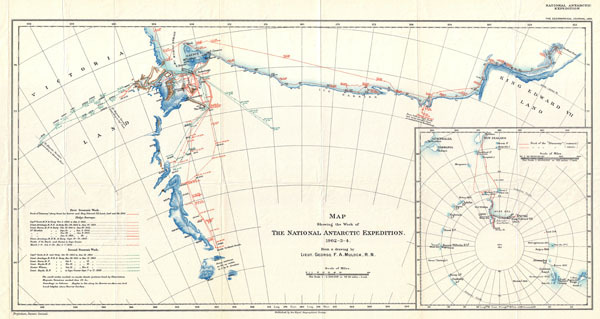 This unusual map details the explorations of the British National Antarctic Expedition. The British National Antarctic Expedition, also known as the Discovery Expedition, (1901 – 1904) was the first official British Exploration of the Antarctic since the explorations of Ross in the mid 19th century. Organized as a joint venture between the Royal Society and the Royal Geographical Society, the Expedition was designed to collect scientific and geographical data regarding the largely unexplored landmass. Considered one of the most important voyages of exploration in the early 20th century, this landmark expedition launched the careers of several important Antarctic explorers including Robert Falcon Scott who led the expedition, Ernest Shackleton, Edward Wilson, Frank Wild, Tom Crean and William Lashly. This map itself follows the coast of Antarctica from Victoria Land, eastward along the Ross Ice Shelf, to King Edward VII Land. Shows the tracks of several important explorers on the expedition as they probed inland toward the South Pole. In several cases the explorations followed the Transantarctic Mountains inland. Shows the routes taken by Scott, Armitage, Barne, Koettlitz, and Royds. From a map drawn by Lieutenant George F. A. Mulock, Scott's second in command. Issued for the 1904 Geographical Journal. Royal Geographical Society (fl. 1830 - present) is a British Society established in 1830 to promote geographical science and exploration. Originally titled the "Geographical Society of London", the RGS received its royal charter from Queen Victoria in 1859 shortly after absorbing several similar but more regional societies including the African Association, the Raleigh Club and the Palestine Association. The RGS sponsored many of the most important and exciting voyages of exploration ever undertaken, including the exploration of Charles Darwin, David Livingstone, Robert Falcon Scott, Richard F. Burton, John Speke, George Hayward, H. M Stanley, Ernest Shackleton and Sir Edmond Hillary. Today, the RGS remains a leading global sponsor of geographical and scientific studies. The Society is based in Lowther Lodge, South Kensington, London. Royal Geographic Society, The Geographical Journal, 1904. National Library of Australia, MAP G9801.S12 1904.